1997 Caulkins Trailer W/disc brakes on two axles and power winch. 2 Cannon Mag 20 downriggers. 2 Cannon plane-r boards and reels. 1 Fish Hawk speed and temperature Probe. 1 Lowerance LCX-15 fish finder W/50 and 200 HZ Transducer W/GPS. 4 Downrigger trolling rods W/Diawa line counter reels. 2 Wire dipsy rods W/Diawa line counter reels. A large assortment of fishing lures and asseccories. 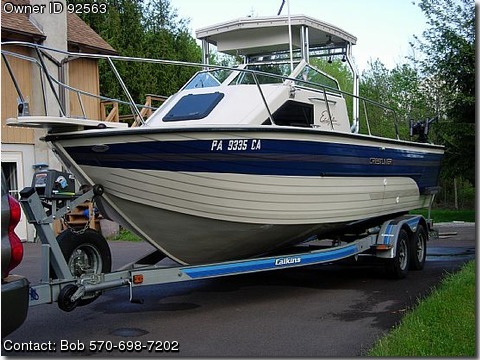 The boat is completely set up for Great Lakes fishing.